1. 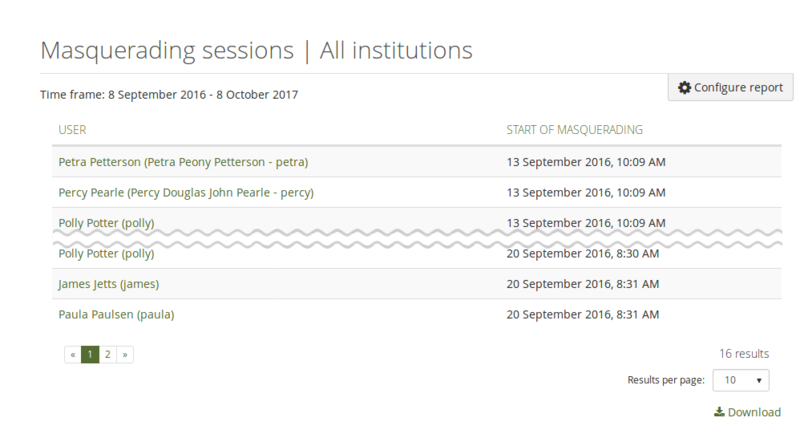 What’s new in Mahara 17.10? Mahara is being improved from version to version. On this page, you see the highlights for the latest release of Mahara. You can see a list of all new features on Launchpad or check out the user-focused features via the „New in Mahara 17.10“ index entries. All statistics and user reports were combined into the new „Reports“ section in the Administration area. Additional reports were created to report over actions by people in more detail. These new reports require that Elasticsearch (minimum is version 5.5) is installed and in use as they can gather a lot of data. In order not to slow down the site, Elasticsearch is used to index report events and make the data available quickly. Elasticsearch was upgraded to version 5.5. This allows Mahara to use a much more modern version of Elasticsearch for fulltext searches and logging of events for the reporting section. If you already used Elasticsearch with your site and want to upgrade, please read the upgrade information. The buttons on the page edit screens are consolidated so that now all settings options are found on the Settings screen. That includes page title and description, layout, and skins. The Share button doesn’t lead to the generic Edit access screen, but to a custom one solely for the page that is being edited and allows for the adding of a secret URL at the same time. You can search your notifications in your inbox and sent messages. This allows you to access specific notifications that you are looking for more easily. The „Group pages“ block was renamed to „Group portfolios“ block to indicate more clearly that pages and collections can be displayed via this block. Group members who have not submitted a portfolio into a group that allows for submissions are listed on the group homepage in the „Group portfolios“ block if submitted portfolios are displayed. Collections that were created in a group can be displayed on the group homepage instead of only group pages. This makes it easier to see to what portfolios the person viewing the group homepage has access. Upload a square logo to your institution’s settings for small devices. This will improve the header display when you are viewing your site on smartphones or other small screens. You can set the signature algorithm for SAML. That allows you to connect ADFS authentication via the SAML authentication method. The SAML authentication method can be a parent authentication method to LTI making it possible more easily to log in via SAML SSO as well as LTI and end up in the same account. You can insert base64-encoded images in any text area via the HTML editor option in the visual editor. You can collapse a standard group on the SmartEvidence overview page, which is particularly useful for large frameworks that consist of many sections.